Avonlea's Jasper Dale: Ain't That the Pistol! As you can see one of my favorite characters on Avonlea is Jasper Dale. He might be a little awkward, but he's still a wonderfully romantice man! Who could forget the beautiful speech he made at his wedding, or the lovely message he left Olivia on his invention when he was in England? I can't, so that's why I created this page. Right now I have all the pages up; 3 of which are complete. Check out the page entitled "A Jasper Dale Day!" for something fun (I need some contributions, please! Don't be shy!) and "Jasper's Photo Studio" for some pictures of Avonlea's favorite recluse. "Golden Milestone: or 25 things you might not know about Jasper Dale" is up and running, finally. With all the information I've found, it could be "50 things" soon. "Jasper's Workshop" is coming along! If finally have it like I want it. I still need to do some research, but all the links now work, and all the "Jasper Episodes" now have descriptions. 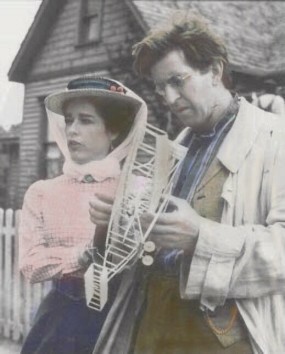 In addition to descriptions of Jasper's inventions I now have a few speeches from Avonlea that pertain to Jasper. I also found a great resource for early films and film making that should add some interesting content to the Workshop. Check back to learn about the kinds of movies the Avonlea Villagers saw, as well as some info on lightbulbs. I think it will be interesting for those of us who want to know a little more about the time period in which Road to Avonlea is based. Please come back soon and visit us soon! This site is owned by Bea Jasperon. Wannajointhe AVONLEA So dear to our hearts Webring? Want to join the Avonlea Webring?